Make a donation to What Color Is Blue today. Film Independent’s Fiscal Sponsorship program opens the door to nonprofit funding for independent filmmakers and media artists. Donate today and help bring What Color Is Blue to life. What Color is Blue is about the internal impotence that we, as queer youth, feel while facing the people, politicians, and organizations that do not want us to exist. 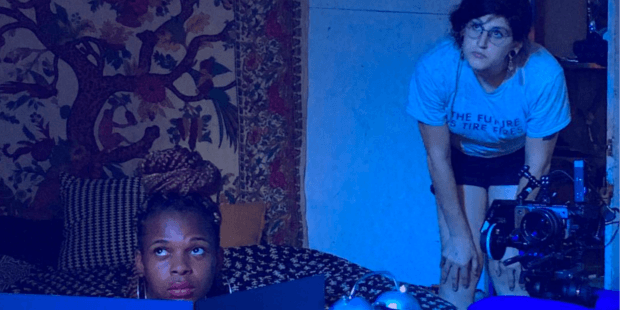 What Color is Blue is an experimental feature-length film that follows a young black transgender woman in Philadelphia as she tries to figure out what responsibility she has to herself and to her community and how to take action to defend it. She wanders through the community alongside Seren, her non-binary partner. They go to political organizing meetings, visit prisons, perform at DIY art spaces and hang out by the river, all while wondering about the meaning of life and what they should be doing to protect their lives and the lives of their friends. Make a donation to What Color Is Blue.